Xaykham is a 17-year-old secondary school student from Nonghet, Laos. The village where he was born and raised is on a hill overlooking over the forest. Life is simple here. Adults go to the field in the morning and return home just before the sun begins to set. Children walk to school, and every afternoon they meet up at a local field to play. 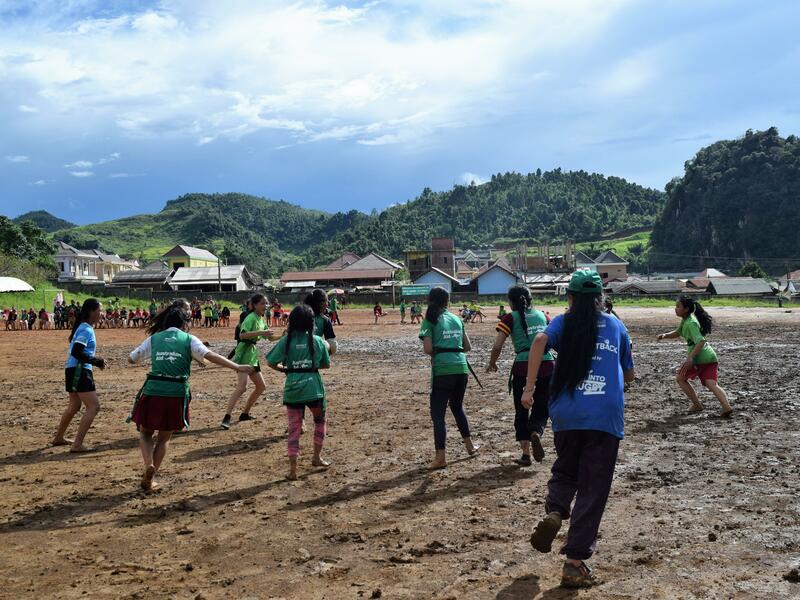 What isn’t so usual, is that these Lao children are playing rugby. Xaykham had never heard of rugby before ChildFund Pass It Back came to his village. “When people came and asked whether I wanted to play rugby, I registered and became a player of my village’s team. The local rugby pitch in Xaykham’s village in northern Laos. It wasn’t long before Xaykham realised he loved the game. He tried not to miss any training and even stayed behind to practice after the sessions had finished. This passion only increased. Seven months later Xaykham volunteered to become an Assistant Coach – someone who helps in team training. He was then given the opportunity to join a Coach Training program. “I learnt a lot of great new skills. After the training, I went back to my home town and began coaching children in my village. Xaykham has now been coaching for three years. He shares the impact that his involvement in rugby and ChildFund Pass It Back has had on him personally: “I was very shy and wouldn’t dare to speak up. I also couldn’t express my ideas very well. He also sees a great deal of positive changes among his peer coaches and other players: “We get fitter and stronger, and we’ve learnt so many new things and gained new experiences. Today, adults in the village on their way home from work are not surprised anymore when they seeing children wearing belt and tags, and playing with the rugby ball. They don’t really understand the game, but they know that everyone taking part is having a lot of fun!